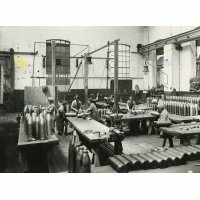 By 1917, around two million workers were engaged in munitions work in Britain. 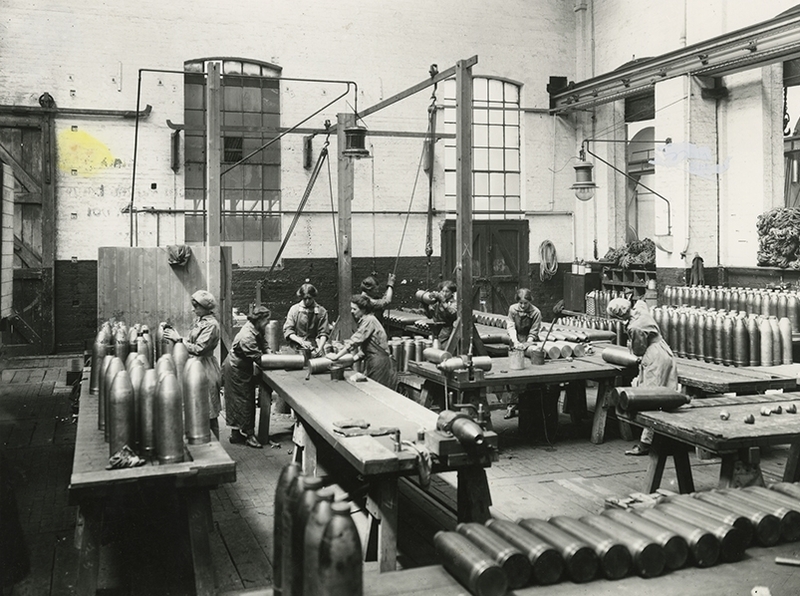 After the 1915 shell scandal, in which the too few private factories were producing high quality munitions, the Ministry of Munitions was created. This was to help co-ordinate the production and distribution of munitions. A consequence of this was for many factories to be brought under state control, one such factory being the Doncaster Works. A schedule of expenditure provided by the National Archives shows that the majority of work carried out by Doncaster Works during the war was munitions work on behalf of ‘Government Departments’. Nevertheless the report also shows that work was carried out for other railway companies. The factory manufactured a range of equipment and supplies, from ambulance stretchers (an order of 750 stretchers was taken in September 1914) to locomotives (23 supplied from December 1916 to early 1917). In October 1914, the Woolwich Arsenal (based in London) requested that Doncaster Works, along with other colleagues of the principal railways, assist in the manufacturing of field gun carriages. This later developed into manufacturing a range of machinery such as anti-aircraft guns, frames, mountings and pedestals. Around the same time as this, the workers at Doncaster also received an order for two armoured engines which would be sent to the front. The most impressive feat by the Doncaster Works was the rate in which they manufactured munitions. In May 1915 around 5,000 fired cartridge cases were repaired per week but by the end of 1916 this increased to up to 50,000 per week. In total, 4,267,093 cartridges were repaired at Doncaster from May 1915 to February 1918. This was also evident in the manufacture of 6” High Explosive Shells. These were first manufactured at a rate of 250 shells per week but, with increased demand, around 1000 shells were manufactured by July 1916. Altogether, 124,000 shells were machined in Doncaster. Although not all workers at Doncaster could be provided with decent work, those that were produced high standards of workmanship in both machinery and handwork. In the report, the accuracy and detail of the munitions produced is praised, with workers having to complete work to within micrometres (which is one thousandth of a millimetre). Special mention is also given to the fact that existing machinery was improved and adopted by armament firms and factories across the country.